Are you tired of washing and drying your vehicle with the fear of water marks? Water marks are caused by mineral deposits in water that eat through your vehicle's finish and leave a nasty haze on the clear coat, glass, metals and more. Sun light expedites this process and can make washing and drying very difficult. You can completely eliminate water marks with the CR Spotless water filtration systems that removes hazardous particles with its amazing filtration process. All natural water has some level of dissolved mineral salt in it. The deionization process uses special resin based filters to collect foreign particles so you have purified water that is safe for washing. To use this machine all you have to do is connect it directly to a water supply and connect a hose to the other end and you are ready to go. You can pre-rinse your vehicle in direct sun and even let your vehicle air dry, without the constant fear of water marks. You can also use it to clean your home's exterior windows, RV, boat, car and much more. 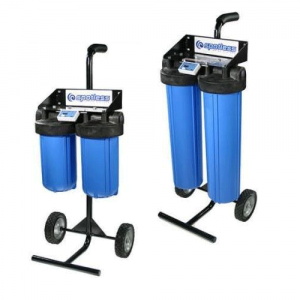 CR Spotless has two different models that do the same thing and just vary in the amount of water they filter. The DIW-20 can filter approximately 300 gallons of mineral free water and the DIW-10 can filter approximately 100 gallons. Each system comes with two filters and replacing them is as easy as sliding one out and sliding the other one in. Both systems come with an electronic monitoring device that will notify you when the filter needs to be changed. Just plug in the device to see if the filter needs to be changed. These mobile units come built on to a handy wheel cart, perfect for any mobile detailer. CR Spotless water filtration systems come pre-assembled, so all you have to do is connect it your water supply and start washing! My opinion after 5 years of use: I just love my system! When I get a chance to wash my cars its usually in full sun in less than ideal conditions. CR Spotless allows me to wash in these conditions and I don't get spots. Excellent product! I have well water, not a problem for CR spotless. Works great, spot free on my black truck. Fantastic product. It's heavier than I expected, and especially heavy when filled with water (I bought the larger model). Don't forget that you may want to get a new hose to use with it as your old one will already have deposits and other junk built up in it. Absolutely a must have as a mobile detailer. You never know what quality of water the customer may have. Definitely must own! Saves so much time and makes washing 100 times easier. I wish I would of bought this sooner.